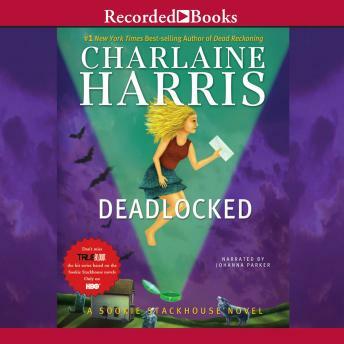 Charlaine Harris delivers hit after hit with her #1 New York Times best-selling Sookie Stackhouse series-the inspiration for HBO's award-winning show True Blood. Here, telepathic waitress Sookie and the supernatural residents of Bon Temps, Louisiana, return in the highly anticipated 12th novel of the series. I really enjoy every book in this series so far. The writing is creative and interesting. The narrator is fabulous. Honestly, I'm working my way through the Sookie Stackhouse series whilst I work (alone in my home office). I loved True Blood but for once I'd have to say the TB adaptation is way, way better than the books it's based on. Deadlocked was deadboring and I only persevered as I'm so close to finishing this yawn worthy collection. Narration, as ever, is flawless, and saves this from being completely mind numbing. Very good! Excitement and action all the way. Enjoyed the storyline. Will be checking for the next Sookie Stackhouse soon. Yet, another great "Sookie Stackhouse" book! Keep them coming, don't stop. I wish the "show" would follow the books, it would be so much better.